Poetry, rhymes, verse and songs are very important to the story of Belfast Celtic and many local ‘turns’ have spread across the world. Not least of these is The Celtic Song – exalted in Glasgow by Glen Daly, borrowing liberally from the lips of Charles Patrick Tully, who brought the song to Scotland on leaving Belfast’s ‘Stripes’ in 1948. Other, less well known poems and verses have fallen under the radar – but they are an incredible way of telling the story of great Belfast Celtic teams of the past. One of these has been lately been dubbed ‘The Stripes are on the Ball’, but many are still unsure if this is the correct title for the tome – indeed a recent appeal through the Belfast Celtic Facebook group yielded little results. In the 1989 UTV documentary Return to Paradise, Celtic star Jimmy McAlinden rhymes part of the poem, listing the roll of hapless victims who fell to the famous Celtic team of the era. A handwritten note from Belfast Celtic fan Patsy Walsh unlocked the rest of the mystery – and firmly pointed to the squad in question – the title winning team of 1927. A native of the St James’s district, Patsy’s family were some of the first residents of the area which fell under the shadow of Celtic Park when the housing development rose out of the Bog Meadows in the late 1920’s and early 30’s. A passionate Celtic man, Patsy served as a ball boy at the ground and later followed the Celts until their untimely and dramatic demise. His father was a tailor and he can recall him ‘patching’ jacket elbows for the irascible Celtic manager Elisha Scott – who was never a man to throw out a good coat when it was in a fit state to mend! Scott’s careful stewarding of his pennies has entered folklore (as Celtic winger Norman Kernoghan and journalist Malcolm Brodie alluded to in the same documentary) and Patsy claims the shillings for the job never made their way to his father! Ferguson and Fulton they were grand. Were the best men in the land. We know they were the goods. We can place this squad in 1927 by examining the personnel mentioned in the poem. 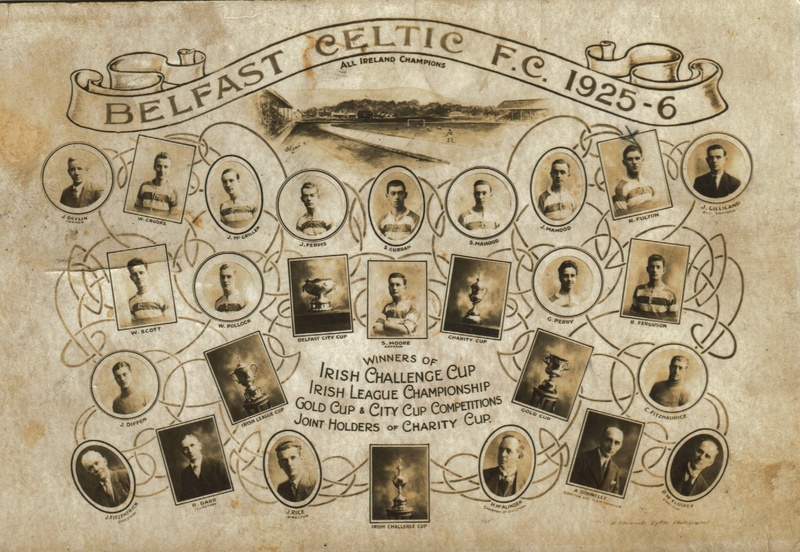 For four straight seasons in the late 1920’s, Belfast Celtic only lost a single game, as they romped to a ‘four in a row’ sweep of league titles. 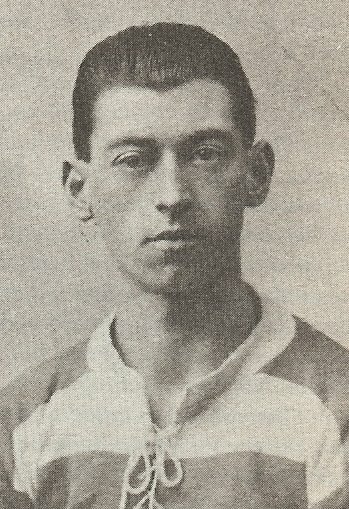 The teams of 1928 and 1929 would have included the majestic Mickey Hamill, but his omission here means the time captured in verse lies before this. In 1927, Hamill was stateside, plying his trade for the long-gone New York Giants (whose name is now carried by a behemoth of the gridiron game), who he joined from Massachusetts side Fall River Marksmen. Indeed, Hamill’s ‘benefit game’ against the big Glasgow cousins took place in Belfast on April 30th 1928 – confirmed by documents unearthed recently by father and son football memorabilia collectors Bernard and Gary Spain, which have been presented to the Belfast Celtic Society. On the same UTV documentary where Jimmy McAlinden recites the poem’s second verse, former player Stanley Wallace recalls that Eddie Inch was at half back on the side he first played with in 1927. Inch holds the key when the 1926 squad photograph is examined – as he is not pictured with his striped colleagues – putting 1927 firmly in the historical picture where this rhyme is concerned. And we travelled to Newry Town. We took the points from Larne. At this point in the poem, Jimmy McAlinden repeats ‘The Stripes are on the ball, the Stripes are on the ball…’, before he tapers melancholically with; “Those were great days!’ – and they were, with Celtic battering all around them. Most of the teams above are recognisable by their nicknames, derived from shirt colours, and local football fans would instantly recognise the ‘Reds’ as Cliftonville, the ‘Whites’ as Distillery and the ‘Blues’ as Linfield. The ‘Glens’ are of course the Oval’s Glentoran and Queen’s Island were their near neighbours in east Belfast, who were voted out of the Irish League in 1929. They were replaced by a fledgling Derry City FC, who filled the long void left by Derry Celtic, who ceased to exist from the onset of World War 1. Signalling their intent, the Candy Striped new boys made ‘Blind’ Sammy Curran from Belfast Celtic, mentioned in the poem, their very first signing, ending his three and a half year career with the ‘Stripes’, in which he netted over 200 goals and became an established Irish International. Portadown and Larne are still mainstays of Irish League football while Newry Town was crowned a City in 2002 and in recent years this Irish Premier League side has hosted Glasgow Celtic for friendly matches at The Showgrounds. Memorably, Newry also played a major part in Celtic’s history by sponsoring the charity games held at Celtic Park in the early 1950’s, which allowed Belfast Celtic’s stars to align to take on their Glasgow cousins, rekindling memories of bygone days. Ards FC, currently plying their trade in the IFA Championship League 1, is a club dogged by financial difficulties for much of their history. In fact, Ards’ Directors in years gone by spoke with gratitude about Belfast Celtic, whose Directors often refused to accept their share of the gate receipts at Castelreagh Park in order to keep the struggling peninsula side afloat. Castlereagh Park itself was sold in 1998 and after ground shares with Cliftonville, Carrick Rangers and local rivals Bangor, Ards currently find themselves a long way from home – deep in Co. Antrim, as guests of Ballyclare Comrades. 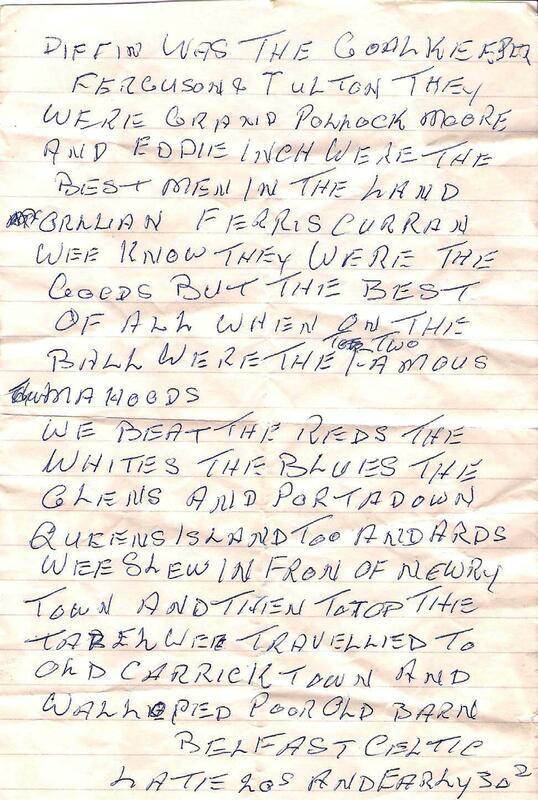 One other club mentioned cements the era in verse as 1927 – the inclusion of Barn United from Carrickfergus. Admitted to the Irish League in 1923, Barn resigned from football in 1928 after struggling to compete with the local big boys. The reference to ‘Poor old Barn’, would seem to refer to their ultimate fate, if also to their treatment at the hands of the ‘Stripes’, who popular opinion now remembers provided them with a football walloping! Happily though, a junior team of the same name was resurrected in the 1950’s and competes at Haslett Park in east Antrim to this day. 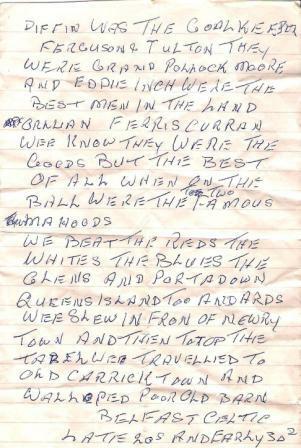 And the famous list of players recalled by Patsy Walsh – the ‘Two Mahoods’ Stanley and Jackie, ‘Blind’ Sammy Curran, Captain Sammy Moore, his understudy Bertie Fulton and the genius Jimmy Ferris also ring out to this day, over 80 years since these ‘Stripes’ were on the ball, bringing glory to Belfast’s famous green and white. You can read more about some of the Celtic Greats mentioned here on our Legends pages. !